The 1,080 bed Sri Jayawardenapura General hospital has been at 80-90 percent occupancy since April. Most of them are dengue patients. The dengue outbreak this year is predicted to be worse than that of last year; which set a record for the highest number of dengue patients in a year. “We had to stop admitting patients for a few hours on Sunday as we had run out of beds, but we opened OPD admissions on Monday when around 100 patients were discharged,” said the General Hospital Director, Dr. Susitha Senaratne. The normal occupancy rate of the hospital is around 70-75 percent and nurses and minor staff are allocated to accommodate such numbers, but with occupancy rates increasing significantly, especially over the last two weeks, Dr. Senaratne said his staff had to work continuously to meet the demands of patient care. The Director said that there was a deficit of 20 percent when it came to nursing staff and most were working 24 hours a day to meet the shortfall. “With such demands on the nursing staff, mistakes are bound to happen,” he said. “In February, we understood that there would be a dengue epidemic soon. So in March, we allocated an extra 500 beds for dengue patients. That too has not been sufficient now,” he said. The hospital has been admitting 400-450 patients suspected of dengue each day. When they had to temporarily close down OPD admissions on Sunday, the patient count had gone up to 900. Thus far, the total number of deaths reported from the Jayawardenapura hospital stands at 12. Jayawardenepura however, is not the worst hit hospital. 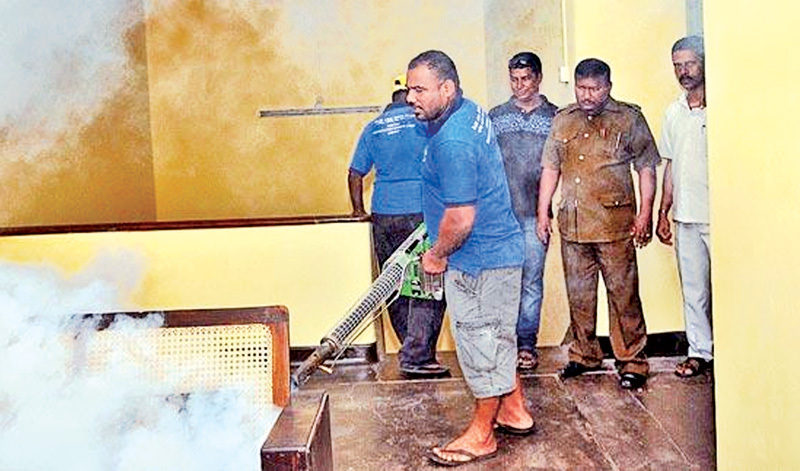 The Infectious Diseases Hospital (IDH) in Angoda has been the central place for dengue patients in the Western Province which has 27,272 cases; the highest number in the country recorded thus far. IDH too shut down its admissions earlier this week as it was unable to cope with increasing patient numbers. They have at present however, re-opened admissions. “We can accommodate 200 patients here, but we had that number increased to 500-600 patients coming in. My responsibility is to ensure all have proper sanitary facilities and we could not do that with so many patients. So we had to temporarily close admissions,” said IDH, Director, Dr. Dimuthu Ratnayake. “The President and Minister of Health visited the hospital this week and they promised that they would arrange dengue units in the surrounding hospitals such as Thalangama. They also promised to release doctors from other hospitals to come here to help us deal with the increasing numbers,” she said. The hospital had received a new batch of nurses and minor staff last month, but it still had to deal with the problem of lack of space and infrastructure. “We also need to take into account the patients' diets, cleanliness, linen and toilets. At present I have 2-3 patients on each bed. We have also added extra beds on to the corridors. We are so crowded, the doctors are finding it hard to manoeuvre their way around during their usual ward rounds,” said Dr. Ratnayake. “The majority of dengue patients seem to come here. Dengue is not a special infectious disease any more, so they can go to other hospitals,” added the director. She further explained that they had informed the Health Ministry earlier on, about a possible outbreak, but no action was taken until the last minute. “It is very easy to set up dengue units in other hospitals. All you need to have is a simple redistribution of instruments and beds,” she said. Dr. Ratnayake added that she expected the current epidemic to continue for the next couple of months. It is not only government hospitals but also private hospitals which have been inundated with dengue patients. The Daily News on Tuesday (20) reported that several private hospitals in Colombo such as Durdans, Asiri Medical, and Nawaloka were ‘struggling to admit dengue patients’. According to Dr. Senaratne however, 30 percent of patients currently admitted at his hospital do not need to be there. “Do not rush to admit. People need to follow doctors’ advice when it comes to admission and not push for it. A large percentage can be treated at home. Admissions are only needed when cases are critical,” he said. “This is the usual dengue peak period but the numbers are higher than expected this year,” explained Dr. Ratnayake, as she explained that this year, the Type 2 strain of dengue which is more fatal had become increasingly prevalent. “We have had 300 patients diagnosed with dengue, out of that 100 are critical (leaking patients). Those that are critical need high dependency care as they are likely to get dengue haemorrhagic fever,” said Dr. Ratnayake. Last year, Type 1 was more prevalent and while numbers were large, the number of critical cases were less. But, this year with Type 2 raising its head, Dr. Ratnayake warned that patients can go into shock even on day one of the fever. “It is better if people get tested for dengue on the first day itself,” she said. Dr. Senaratne who also reiterated the IDH Director when it came to dengue numbers, also observed that this year, cases had started to appear early on. “We had dengue cases being reported from March itself this year. It is unusual for dengue to appear during the dry season, as it usually peaks during the monsoons,” he said. The Jayawardenapura Director noted that they had discovered various evolutionary changes in the female mosquito of the species Aedesaegypti which had lead it appearing earlier on and it was also laying more eggs. “Our methods of controlling breeding has to be updated in this instance. The mosquito is adapting faster than our control measures,” he said. Dr. Senaratne also pointed out that areas such as Battaramulla and Thalawathugoda were not known for dengue earlier, but were now reporting an increasing number of cases. He added that the recent floods and the prolonged issue of waste management around the country could have further worsened the dengue situation. According to the World Health Organization (WHO), there are four distinct but closely related serotypes of the virus that cause dengue - DEN-1, DEN-2, DEN-3 and DEN-4. “Recovery from infection by one provides lifelong immunity against that particular serotype. However, cross-immunity to the other serotypes after recovery is only partial and temporary. Subsequent infections by other serotypes increase the risk of developing severe dengue,” explained the WHO. According to WHO data, “In 2017 (as of Epidemiological Week 11), the Western Pacific Region has reported dengue outbreaks in several Member States in the Pacific, as well as the circulation of DENV-1 and DENV-2 serotypes”. According to IDH Senior Consultant Physician and dengue expert, Dr. Ananda Wijewickrama, there are generally one or two strains prevalent in any given area and after a couple of years, new types replace the old in prevalence. “We don’t know why this happens but it has been the case around the world,” he said. He noted that the number of dengue cases had been increasing over the past several months but had gone unnoticed among the general public as well as the authorities. “We had our biggest outbreak in 2016 with 55,000 cases being reported. In the first six months of this year alone, we have recorded 65,000 cases. And we still have six months more to go,” said Dr. Wijewickrama. Commenting on the increase, he said that the erratic rains during the dry season this year followed by the floods, had simply allowed the virus to start spreading early. “The cases started earlier on, so by the time the monsoons came, we had already built up quite a number of cases. That is why we have more numbers this year,” said the dengue expert. The changes this year thus, shows that in addition to preventing mosquito breeding, authorities would also need to seriously factor in climate change as one of the drivers of dengue. A study published by Hales et al in The Lancet in 2002, estimated that with climate change and population growth factored in, 50-60 percent of the Earth’s population would be at risk of dengue by 2085. Without climate change, they estimated that the number could fall to 35 percent. In Sri Lanka, we are at double the risk as even the basic dengue preventive measures have not been able to sustain themselves over time. “We have issues with waste disposal, our preventive programmes both at the individual and institutional level are not effective. The community is not helping and the media is not interested,” said Dr. Wijewickrama. He explained that the number of deaths could be reduced through early detection but as numbers increase, the chances of patients going undetected would simply rise. “We will not have the resources to monitor all closely,” he added. As Sri Lanka was a country which successfully eradicated Malaria, Dr. Wijewickrama believed that we could do the same with dengue, but this would need more concerted and continuous effort from all sides, if it were to be a success. “Malaria took a long time to eradicate but we can do the same here. However, we need more effort,” he said. Despite several attempts made to contact National Dengue Control Unit, Director Dr. Hasitha Tissera, he was not available for comment. Given the increasing prevalence of Type 2, Sri Jayawardenapura Hospital is at present conducting research to identify the characteristic of patients who are prone to bleeding (Type 2). “We are analysing every patient we get and recording their details. This will allow us to identify if there are any patterns related to their disease and other characteristics such as age, weight, etc,” said Dr. Senaratne. He expected their research to be concluded in the next few months. “If we can identify these high risk people, we can immediately take action to control the virus,” he added. Generally pregnant women, persons with diabetes, children and the old are known to be at high risk for dengue. In addition, those who have been infected with dengue once also have a higher chance of being infected again. “Secondary people are at high risk. It is like a viral flue, they can get it again and again,” said Dr. Senaratne. “Ideally, if we treat a patient early and identify it early, no one should be dying of dengue,” said Dr. Senaratne.